Ibiza is an upcoming neighbourhood for higher class tapas bars. 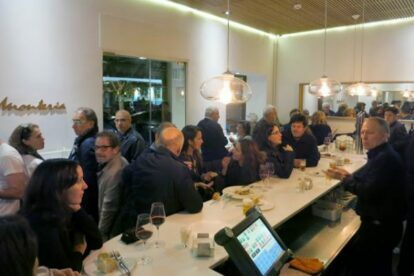 In recent years, it’s enjoying popularity due to the many bars and locations just beside the Retiro park. This bar has been renovated without losing its personality. La Montería has existed since 1963 and this history can be felt by how the staff treats you, and from its traditional great food. The staff is very important in my opinion. Compared to other countries, Spain doesn’t have students working behind the bar — you have professionals. In many bars you can find old waiters. I can tell you, it seems they have the profession in their blood. Unfortunately, this will change because of how the restaurant business is in modern times. Until then, La Montería is one of those places where you will feel this. There is a backdoor restaurant, but what I love and recommend is that you remain standing at the crowded bar — the Madrid feeling. Their wine is excellent, but beware the waiters will not stop serving you wine exactly when you need an extra one. You will enjoy it, but take into account your wallet could suffer. As for food I think everything is excellent although I would recommend their rabo de toro (Bull’s tail). It’s one the Spanish cuisine most delicious dishes as its an elegant smooth meat and silky sauce. It has a strong taste, so it combines very well with a strong red wine. Oh wait! They just served me another one?